Charles Cain etcher, painter and watercolourist. Cain studied at Camberwell School of Art and then as an illustrator cartoonist for the Johannesburg Star until World War One when he joined the Border Regiment in India and Mesopotamia until Armistice. He first gained national recognition for his art of World War One. Shortly after the end of the war the Imperial War Museum purchased thirty of his drawings. He entered the Royal College of Art under Frank Short 1920-1 and created his first published engraving in 1921. During the 1920’s and 1930’s, Charles W. Cain produced seventy-four original etchings and engravings, all published in London by Greatorex. 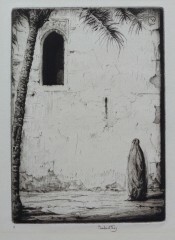 The large majority of his prints deal with scenes in Iraq, Persia, Indian and Burma and Cain developed a strong reputation as a major Orientalist printmaker. Today, a large collection of Charles Cain’s drypoints will be found at the British Museum, London.